September 28, 2005 Brian R.
During a wonderful discussion during lunch today I realized something. Podcasters are the Outsider Artists of the audio documentary/Radio world. An outsider artist in the art world is someone who doesn’t have formal training in the fine arts, may not consider themselves an artist, and creates prodigious amounts of art work. When I make podcasts I don’t use editing much (thus my editing training goes out the window), I don’t consider myself a journalist (but occasionally a documentarian), and I record and share lots of audio. Other podcasters are much better examples of outsider artists than I. I’ve been interested in the technical and professional of audio and video for years. Interesting when you put things in parallel isn’t it. So far this morning at the Duke Podcasting Symposium I’m really enjoying what Doug Kaye has to say. His entire presentation exudes a feeling of understanding, of GETTING IT. Wether it’s a non-profit model or a for profit model. IT really is helping people, while making enough money to keep doing it. Getting this IT is REALLY important. A title for one of his slides is ‘The Value of Free’. Basically if someone can’t link to it – content like audio – there can be no conversation about it. Podcasts and blogs exist because of conversations created by linking via html tags. This all comes back to what Doc Searls has been saying for years, “Markets are Conversations”. (see The Cluetrain Manifesto) Facilitate conversations and you have a business with a soul. Why should businesses help citizen journalist create media? To help people reach their passion points. A passion point according to Michael Geoghegan is the place where a person is super happy doing what they love. In his example getting free pre-release movies on DVD. My passion point is seeing people make their own media that creates a loud voice against injustice. 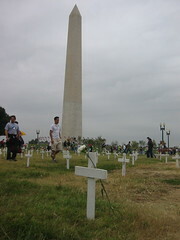 September 26, 2005 Brian R.
Here is one picture from the the Anti-War Rally in DC we went to on Saturday. It also happened to be my 35th birthday. I spent a lot of time thinking about how thousands of human beings are murdered so others can profit. It humbles you tremendously… It was a sad yet hopeful event. Invigorating yet grounding. Hundreds of thousands of people together for peace. Over all we were there FOR something not just AGAINST something. Albert aka DragonBallYee took great pics and I have a flickr photoset here. 8:30pm EST : I’m watching live, the JetBlue flight 292 circle LAX on the cable news channel MSNBC. The airplane is having serious landing gear problems. They are about to make an emergency landing. The LA NBC affiliate news host just reminded the MSNBC folks that all of the Jetblue planes have TVs in their headrest. It’s possible the passengers could be watching the news coverage of this event as we speak. In attempt at being reassuring the host told the passengers that everything that could be done is being done. I almost hope they are not watching. How horrible to see this perspective from INSIDE an airplane. Is this a media first? The plane should land within minutes. UPDATE: 9:20pm EST The plane has landed safely. The front landing gear just melted away without collapsing. They brought it to a complete stop with no apparent fire. Wow! MSNBC says they have spoken ( or texted via a blackberry?) to a passenger on the plane “confirming” that the TVs on the plane were turned off. They also say that there were MSNBC Universial employees on-board whom have texted them. 9:42pm Now they are speaking to a passenger via cellphone who is on a bus just off the plane. He just said that the passengers where watching MSNBC and “getting great information from MSNBC”. He was sitting in the exit row. He also said they shut off the LIVE TV along with the air conditioning three to four minutes before landing. On Saturday, September 24 in Washington, DC a lot is going on to help END THE WAR IN IRAQ! Here is the basic schedule from United for Peace and Justice. 3:00PM “Operation Ceasefire” Concert featuring Cindy Sheehan, Jello Biafra, The Coup, Le Tigre, Thievery Corporation, and more! Check out this map with the march route. Click on it for Google Maps info. I finally gave Audio Activism’s podcast feeds an overhaul. The main podcast feed http://www.audioactivism.org/wp-rss2.php now has iTunes specific syntax. It basically makes AudioActivism easy to subscribe to and look nice in iTunes (plus some extra metadata that I admit is cool). Though I really wish Apple would work with the RSS 2.0 dev community and help create standardized RSS podcast syntax. I mean it’s like the browser wars all over again! All of the other RSS feeds for AudioActivism.org still work. You can find them all here on the Feeds page. (Ex. RSS 2.0 Valid, Atom, RSS 2.0 Valid with Comments, RSS 2.0 Valid PSA Podcasts, etc.) I must admit I was inspired to create a feeds page by the daily video blog RocketBoom. They have a very simple RSS page with links to all their RSS feeds. Sweet!